For most businesses obtaining patents and costly R&D go together like love and marriage – you can’t have one with out the other. Or can you? The cost of R&D that underlies a particular invention varies greatly by industry, business model and area of technology. 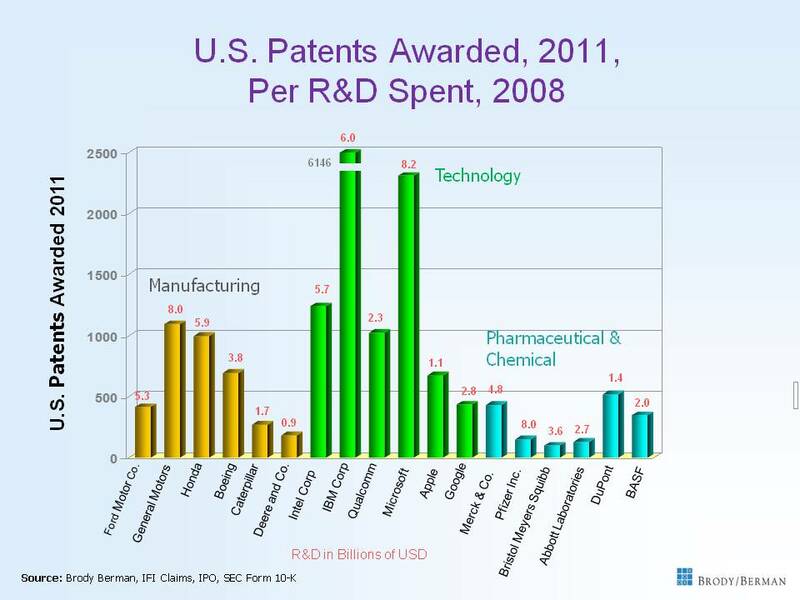 In pharma, for example, a lot of R&D typically yields a handful of patents. Those that are valuable are very much so. In the IT industry, however, some patents can be generated with relatively little R&D. Software patents and algorithms, for example, often do not require the same level of costly research as chemical or bio-pharma inventions or those in the semiconductor space. They still require a lot of thinking, planning and awareness of prior art. The most efficient patentees may not hold the best quality rights. Similarly, those with the most expensive patents have no guarantees about their value or the return they may generate. Some IT companies that spend significantly on R&D generate abundant numbers of patents (e.g. IBM, $6b 2008 R&D; 6,146 patents in 2011), while others who spend more modestly, and file more selectively, generate patents at a higher average cost per patent (Qualcomm, $2.3b R&D; approximately 1,000 U.S. patents). Do those who spend larger sums on R&D and file more actively secure better or more valuable inventions or rights, or those that generate greater return? Probably not. Patent yield or efficiency is easily ignored. It is, however, central to return on IP (ROIP) that a company generates. More R&D and more patents (at a lower cost per patent) are very limited indicators of success, but it would be inaccurate to say they mean nothing. A lot depends on the purpose of the R&D: Is it to obtain patents that provide design and sales freedom? To reveal ideas for new products? To generate licensing income? All of the above? The first Brody Berman-researched graph above employs a three-year delay between R&D spent and patents issued, to provide an idea of the role prior research might have played in current patent issuance. IBM is off the above chart (literally) in terms of R&D spent ($6 billion) and patents obtained, with almost three times as many U.S. patents secured as it’s closest U.S. competitor and even higher spending rival, Microsoft. On the other hand, Apple spent a fraction of the R&D ($1.1b) and received about a 1/10 as many patents. What is to be learned from all of this? That the manner in which companies obtain patents, or the volume they produce, is not necessarily tied to patent quality or return. The bigger portfolios are not always better, but frequently can be relevant because matters, especially to operating companies contemplating enforcement against large holders. Infringed parties immune to counter-assertion, like NPEs, increasingly key players in patent monetization, are less likely to care. Companies (and shareholders) need to look carefully at not only how many patents a business produces and what they cost, but what those patents provide in term of direct and indirect return. For most companies it remains a mystery. Businesses are encountering new ways of directing R&D dollars, securing patents and monetizing them. Generating them the old-fashioned way – internally from R&D — may or may not be the best method. 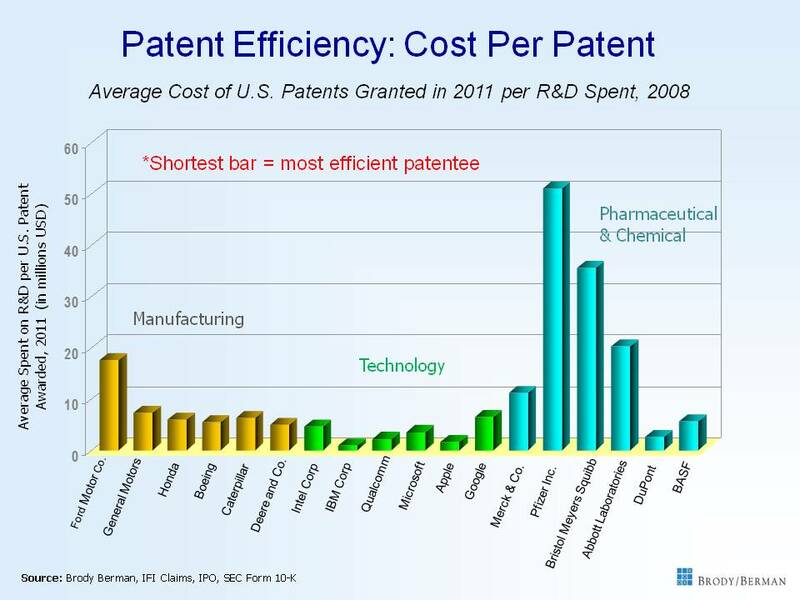 More patents at lower cost does not necessarily mean higher productivity or better business performance. Business that deploy patents as part of their business strategy need to be clearer about their true costs and real return.